The next day, when the rum wore off, he still thought it was a good idea and he got to work. 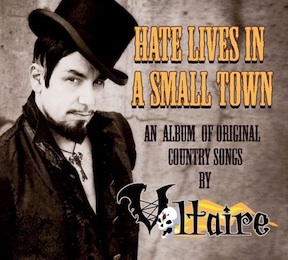 The result is a collection of original Country songs by Voltaire that pay tribute to the the original spirit of country. Humorous, occasionally dark and always truthful, these songs hail back to a time when country was about storytelling and getting to the truth of things. In that light, Voltaire fans will realize that this CD isn’t such a departure for him after all.